SCSM Entity Explorer is a tool for System Center Service Manager (SCSM) administrators to help them browse and get information about the classes, enumerations and objects stored in the SCSM database. Today I have release the first public version of my SCSM Entity Explorer, a tool aimed for SCSM administrators to help browse the entity types in SCSM in a convenient manner. 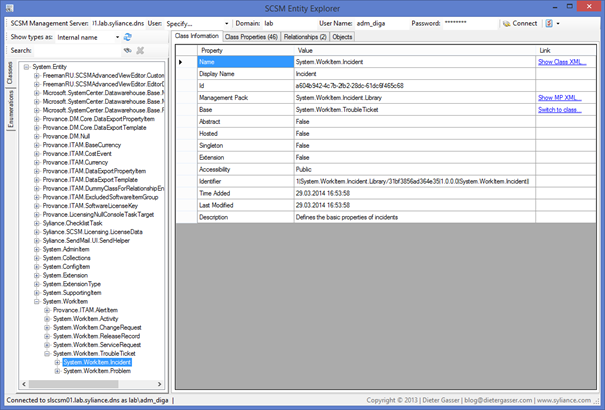 SCSM Entity Explorer allows you to browse classes and relationships in a easy to use tree view and to get all details about the entity types, such as properties and relationships. Using the built-in search, you can find classes and enums very quickly. SCSM Entity Explorer allows you to retrieve a list of all instances of a class and to view the details of a class instance, including all its properties and related objects. Last but not least you can open the Management Pack which defines your entity type in an XML editor of your choice with one single mouse-click.